How does the idea sound of living in a cute shipping container home with beautiful surroundings and no utility bills? Ever! 2 men from Seattle made it happen. Simple and budget friendly shipping container home build. You might have been thinking about building your own shipping container home for a while but never quite managed to get the project going. 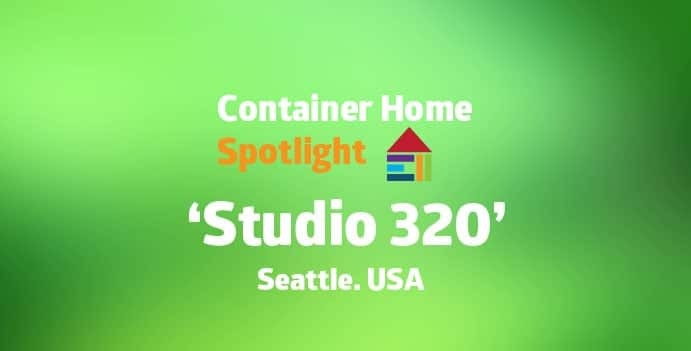 What I love most about the story of architects Robert Humble and Joel Egan from Seattle is that their small scale construction is perfect inspiration for beginner container home builders. They had both thought about creating a sustainable retreat for some time before deciding that shipping containers would be the perfect way to do it. Robert and Joel took 2 x cargo containers and a whole bunch of other recycled materials to create a 320 sq ft weekend retreat home close to Mt. Rainier, Seattle. When you see their story you will probably be left feeling ‘I can do that too’. Allocating a majority of the space to the living room area made more sense to him. Plenty of light flows through the container thanks to large floor to ceiling windows. Inside the bathroom is an example of how space has been optimised again with a wet room. This means that the bathroom is a kind of big shower. Rather than having a separate toilet space the shower and toilet are combined into one area. Adjoining the container is a patio that extends out and is perfect for hosting summer BBQ’s or just sitting out enjoying the nature with a morning coffee – freshly prepared in the home’s kitchenette. Eco-friendly and no utility bills. The retreat has everything for comfortable living and it’s off the grid. Gravel stones were spread on the roof over a space measuring 160 sq ft. to collect rain water. This rain water then filters down into blue coloured barrels attached to the side of the container. The barrels supply water to the kitchenette and bathroom. On the remaining roof area is a green nature garden which helps to insulate the container and a solar panel that generates electricity for the home. Both Joel and Edgar were conscious about the eco-friendly credentials of this project so used a number of other recycled materials during construction. Ply wood lining used on the container walls was recycled from a local school. Counter top made from 100% post consumer waste. Back splash in kitchen and bathroom (used to be Joel’s kitchen counter top) allows light to flow through from main room. And because the shipping container home can be taken down within 2 hours it makes it easy to up sticks and move to another location. Although I doubt there are plans for them to do this any time soon as the views are absolutely perfect! Editors note: The content displayed in this blog post is for editorial purposes. Adaptainer had no part in the design or build of this particular shipping container home but do offer bespoke container conversion services. ← New Watford Market built from shipping containers – watch how it was created.